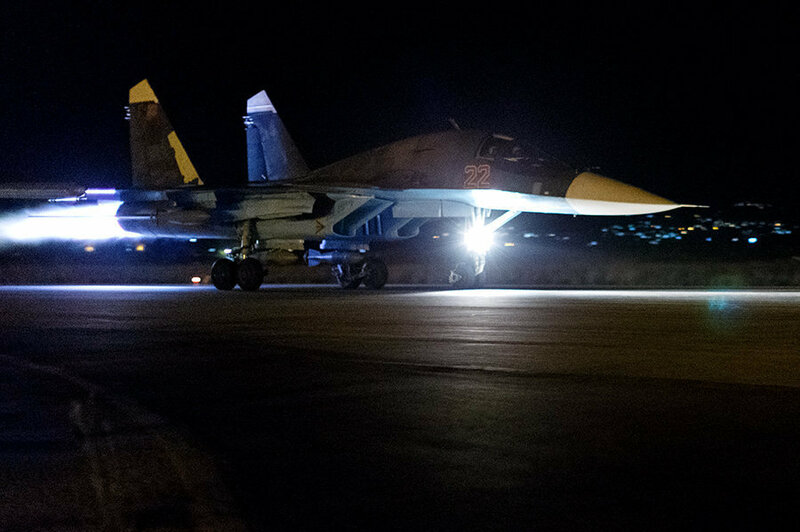 Ever since Russian forces deployed the Sukhoi Su-34 Fullback to fly anti-Daesh missions in Syria, the advanced fighter bomber (thanks to its impressive performance) has been expected to become a future export bestseller. The future has arrived – Algeria is said to have ordered 12 Su-34s. Sergey Smirnov, the director general of the Novosibirsk Aircraft Production Association (NAPO), confirmed that the company, which produces the Sukhoi Su-34, received a formal request for the export version of the aircraft. The North African country "is likely to become the first of many new customers for the new long-range strike aircraft," defense analyst Dave Majumdar wrote for the National Interest. "The North African nation already operates another advanced derivative of the versatile Flanker airframe called the Su-30MKA, but the Fullback bomber variant adds a dedicated strike capability." Other potential buyers could include Vietnam, Iraq, Kazakhstan, Turkmenistan and Uzbekistan, military expert Igor Korotchenko told RIA Novosti last October. The analyst added that Ethiopia, Nigeria and Uganda could also purchase the 4++ generation jet, which can accelerate to a maximum speed of 1,200 mph and has a maximum range of 2,500 miles without refueling. In the meantime, the Su-34's combat experience will allow NAPO to upgrade the warplane so that it could reach its full potential. "These modifications could include additional electronic warfare (EW), intelligence, surveillance and reconnaissance (ISR) and other capabilities added via external pods," Majumdar quoted Smirnov as saying. The Russian Armed Forces have received a total of 83 Su-34s, costing $36 million apiece, and are expected to ink a deal for the delivery of over 100 Su-34s in the next 2-3 years. At least eight warplanes are believed to be engaged in Moscow's counterterrorism operation in Syria. 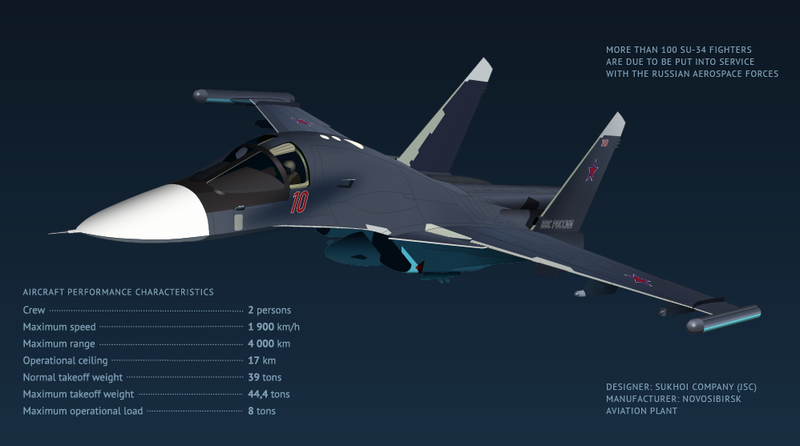 Based on the Sukhoi Su-27 Flanker, the Su-34 is meant to replace the aging Su-24 Fencer. "Like the Fencer, the Fullback has side-by-side seating. 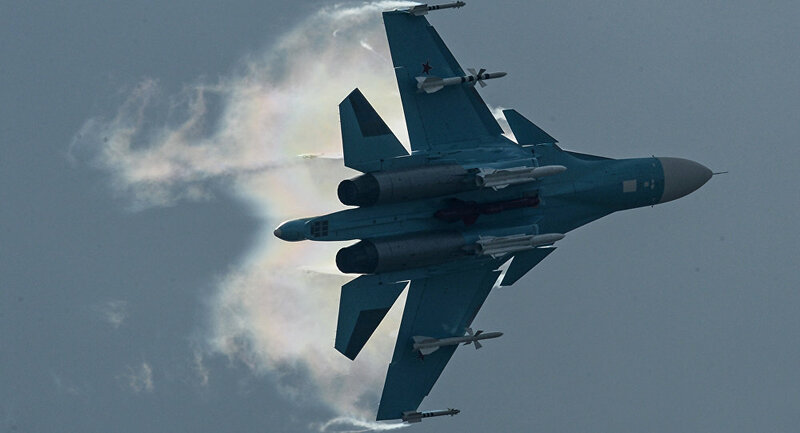 Unlike the Fencer, the Su-34 – taking full advantage of its Flanker lineage – is provisioned with a formidable air-to-air self-defense capability," Majumdar explained. The Su-34, which is designed to serve in tactical bombing, attack and interdiction roles, is armed with a 30 mm GSh-30-1 (9A-4071K) cannon, rockets, air-to-air, air-to-ground and anti-ship missiles, as well as guided and unguided bombs. "In addition to short-range R-73 high off-boresight dogfighting missiles, the Su-34 carries the long-range radar-guided R-77 air-to-air missile. That means [that] the Fullback is able to conduct 'self-escorted' strike missions. It also has an unorthodox rearward facing radar to warn the crew about threats approaching from behind," the defense analyst observed.